Alexa Guarachi and her doubles partner, Erin Routliffe, sat dejected at the Bank of England Sports Center in Roehampton, England. It had appeared that they would make it in to the qualifying tournament for The Championships, Wimbledon. But, with five minutes left in the sign-in period, the one-time University of Alabama tennis stars were informed that they had been bumped from the field, which is established based on the combined world rankings of the players. Then, the unexpected happened. The pair was summoned to the referee’s office. There had been a mistake. They were in. Guarachi, now 28, and Routliffe made the most of the opportunity. They won both of their matches at Roehampton, and they were on their way to the most prestigious tennis tournament in the world. There, in July, they lost in the first round to the eventual doubles champions, but made a respectable showing, taking their opponents from the Czech Republic to three sets. And, there, Guarachi graduated to the big leagues of tennis. “I had been to Wimbledon as a junior, but stepping onto the court as a professional was a totally different thing,” Guarachi said. “It definitely lived up to the hype. Playing at that level, the accommodations are better and the support is greater. I looked around the locker room and there was a former champion, Simona Halep. Again, Guarachi and her partner (Vera Lapko, a native of Belarus) were knocked out in the round of 64. 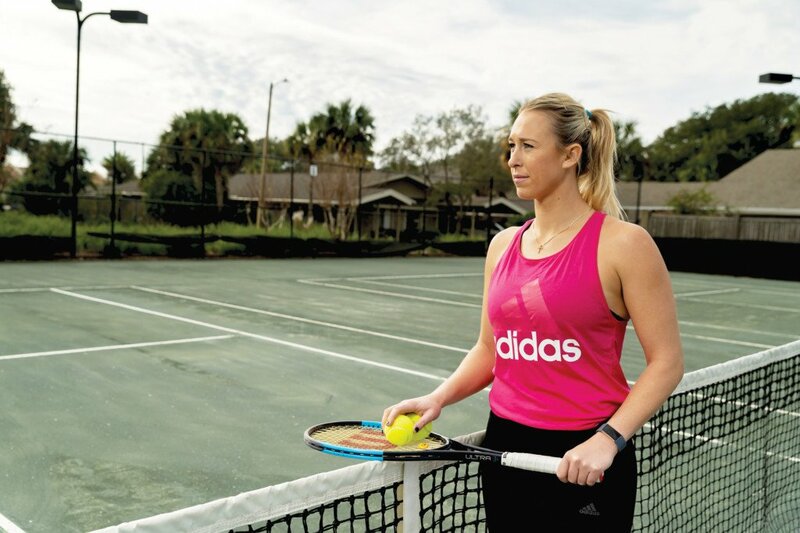 But Guarachi returned to the Destin Tennis Club at Seascape — where she learned to walk and to hold a racquet and where her father, Fernando, has been the pro for more than 30 years — with the confidence that she can accomplish her ambitious goals for 2019. Ranked 77th in the world following the 2018 season among women’s doubles players, she hopes to crack the top 50, play in all four Grand Slam tournaments — she and her partner, Alison Van Uytvanck of Belgium, were eliminated in the first round of the Australian Open in January — and qualify for a spot on Chile’s Olympic tennis team. Representing Chile, Guarachi will play in the Pan Am Games in Lima, Peru, in July in hopes of gaining an automatic entry to the Tokyo Olympics in 2020 by winning a gold medal there. After spending a few days at home following the U.S. Open, Guarachi, who now lives in Bay Point in Panama City Beach, played in Chicago and then embarked on travels that included stops in Uzbekistan and at the Hong Kong Open, where she and partner Giuliana Olmos of Mexico reached the semifinals. To reach the semis in Hong Kong, Guarachi and Olmos defeated the No. 10 team in the world, American Abigail Spears and Alicja Rosolska of Poland. They advanced to play Zhang Shuai of China and an Australian, the heavily muscled Samantha Stosur, who won doubles titles at the U.S. Open (2005) and the French Open (2006) and was the U.S. Open singles champion in 2011. At one time, Stosur was the No. 1 ranked doubles player in the world. Guarachi and Olmos played a strong first set against the favorites, falling 4-6, before faltering in the second set, won by Stosur and Zhang, 6-1. Afterward, Fernando was inclined to call his daughter to congratulate her on her fine showing. Holly served as her daughter’s first coach and held out the opportunity to “one day practice with your father, if you are good enough” as an incentive to Guarachi. Both Holly and Fernando are certified teaching pros, but he is senior in that regard. Fernando was the director of tennis at Sandestin Golf and Beach Resort when he met Holly, then an FSU student, who worked for a semester at the pro shop. Holly played tennis in high school, then moved to Turkey where her father, with the Air Force, was stationed when she graduated. She traveled, took some college courses — the University of Maryland had a presence at the Incirlik Air Base — and left the game of tennis behind until she returned to the United States and met her future husband. Holly challenged Fernando to a tennis match, which she counts as their first date. He gave her points — two when he was serving and one on her serve — but won, 7-5. “I have slowly been getting my revenge ever since,” Holly said. She credits her husband with teaching her how to teach. Holly began working with her daughter on the court when Guarachi was 6. Sessions were limited to 30 minutes. “Sometimes, they only went 20 and then it was like, ‘Oh, squirrel,’” Holly recalled. Guarachi recalls very well her experience as a 7-year-old playing her first tournament, held at Bluewater Bay. She won the consolation round trophy and told her parents that she no longer wanted to practice. She just wanted to play tournaments. Fernando attended an American Catholic high school in Chile. As it happened, the tennis coach at the University of South Carolina at the time was on his way to Tuscaloosa, where Alabama athletic director Bear Bryant had discovered an interest in international athletes, primarily in the interest of strengthening his football teams. Fernando was awarded a full-ride tennis scholarship. He would discover that textbook English didn’t always coincide with the colloquial speech heard on campus. Fernando’s first tennis instructors emphasized fundamentals in the same way that he later would. He attended a clinic in Chile, where students began by practicing strokes without striking a ball. As he started to enjoy tennis success, Fernando decided to forgo soccer, easily the most popular sport in Chile, and to focus on tennis. When other boys were kicking a ball around a field, he was hitting a ball against a wall. Holly passed Alexa on to Fernando when their daughter was 11, but he already had discovered her competitive nature. As his wife had, Fernando adhered to the approach of not spending a lot of time on the court, but quality time. He asked his daughter to give him 100 percent for one hour, for two reasons. First, it was a way to avoid burnout. Secondly, because Guarachi didn’t find herself playing while tired, she hit her best shots throughout practice versus just trying to get the ball back. At age 12, Guarachi won a national USTA championship, playing in Arizona. At 14, she graduated from USTA play to International Tennis Federation (ITF) tournaments. She had worn out the competition in Florida and the Southeast and needed greater challenges. She made her father promise to buy her a Walkman if she won a tournament in Egypt. Unbeknownst to him, she struck a similar deal with her mother, that one involving sunglasses. Guarachi won the event and cashed in. Her ITF successes made Guarachi a top tennis recruit. At one point, she had a backpack full of letters from schools around the country. She settled on her father’s alma mater and, four years later, would join a small pool of touring pros with four-year college degrees. These days, Fernando serves Guarachi as agent and coach. He is working to win over sponsors. And, at this writing, he is trying to secure a full-time coach for his daughter who would travel with her and give her immediate feedback as matches are held. In Chile in October, he met with an “image builder” who lined up eight media interviews for Guarachi, including one with ESPN. Fernando acted as her interpreter. Today, Fernando and Holly believe that the best is yet to come for their daughter. But her tennis future was in question in 2015 when she tore an ACL while playing in Waco, Texas. Renowned sports medicine surgeon Dr. James Andrews repaired the damage, but Guarachi entertained thoughts that her tennis career might be over. “I thought the injury was maybe a sign that there was something else in my life that I needed to be doing,” Guarachi said. “But then I realized that I was going to have to rehab my knee no matter what, so I committed to a comeback. Guarachi wore a brace for about five months after returning to the court. Then, she burned it. Holly and Fernando have succeeded in grooming a power player whose serve tops out at 120 mph and who is past the point where she is intimidated by anyone. Titles, to some extent, may be a way for Guarachi to pay her parents back. While tennis is famous for bad boys (John McEnroe, Ille Nastase) and even some bad girls (Maria Sharapova), Guarachi hopes always to be both humble and competitive and to remain a good winner and a good loser, no matter her ranking. In that regard, her older brother Stefan, who loves dogs, movies and the Incredible Hulk and has Down syndrome, is immeasurably helpful. “I think I am having a bad day, and then I think about Stefan and I realize how fortunate I am just to be able to play tennis,” Guarachi said.